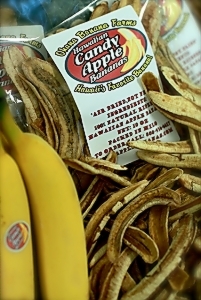 What’s better than a Hawaiian Candy Apple Banana? A Dried Candy Apple Banana! The same nutritious, tasty and sweet banana grown right here on the Big Island of Hawaii is air dried (not fried) and packaged for your enjoyment. Dried bananas are great for snacking on the go since they can’t be accidentally smashed and there’s no peel to deal with later. A sweet and healthy treat any time!